For Adults Only, Sensimar hotels guarantee you a truly relaxing holiday, where you can unwind and leave the stresses of everyday life far behind you. You'll find a huge range of hotels in beautiful settings, offering child free peaceful breaks with theme nights, gala dinners and many offering spa treatments for that added bit of relaxation. Upgrade to Full or Half Board for free on a selection of luxury hotels. Receiving your upgrade is easy, just select the upgraded board basis when going through the booking process and this will be applied automatically. Grab a free childs place on next Summers holiday when you book today. You will need to be quick as these free kids places go very fast. The earlier you book, the more time you will have to pay off your Holiday, you'll also have the best choice of holidays and dates so you can be sure of finding the perfect get-away. You'll only need to pay a partial deposit. You can then pay the rest 12 weeks before your departure date, so you can secure your 2020 holiday for a fraction of the cost. You can also book-now-pay-later by direct debit, it's a quick and easy way to spread the cost of your holiday. Get the best Free Kids places - TUI offer thousands of Free Kids places but they can go quickly - so if you want the pick of the best dates and destinations, the earlier you book, the more chance you'll have of snagging the best Free Kids places. Where do I use my TUI voucher code? Select the code you wish to use from NetVoucherCodes.co.uk. Follow the link to tui.co.uk. Choose a TUI holiday package and click ‘Continue’. Enter your holiday details, choose your flights, and add any optional extras before clicking ‘Continue Booking’. Check the details for your booking. On the last booking page, you can enter your code. The total price of your holiday will update in the summary on the right-hand side of the page. Enter all your personal details before clicking ‘Continue Booking’ to finalise your booking. "Save money on flights by booking in advance and flying midweek." 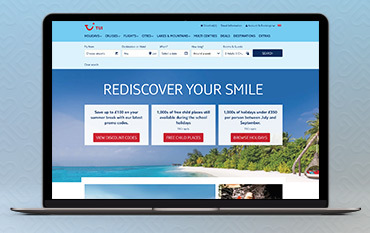 Make holiday booking effortless with TUI’s easy to use website and booking system. Simply browse around online for your ideal holiday, whether that be an all-inclusive holiday with everything included, a family holiday at a kid and adult friendly resort, a beautiful beach holiday in a stunning location, a luxury holiday in a 5* destination or a short haul mini-break to a world-famous city. If you’re not sure about where you want to go then take a look at the destination list which features locations like New York, Spain, Greece, Srilanka, Mexico, Maldives, Cuba, Turkey, Barbados, Florida, Iceland and Las Vegas. If you have a resort preference then the collections section is the place for you. In this area, you’ll find exclusive holidays in TUI Family Life, TUI Sensatori, Sensimar, Magic Life, Blue, Robinson and RIU category’s, plus many more. If you’re working on a budget then check out the deals section where you’ll find board upgrades, last minute holidays, summer 2019 deals and the Free Kids Place Finder, allowing you to tailor make your holiday to your liking for a low-cost price. With TUI, there’s no need to spend hours searching around for all your holiday necessities. As everything you need is in one place you can simply head to their website, select all your requirements including your hotel, flights and extras and book in a matter of minutes. With holidays to hotels and resorts all over the world, flights to thousands of destinations and extras such as travel insurance, currency exchange, airport parking, airport hotels, excursions and car hire all available to book on the TUI website, booking a holiday has never been easier. And with so many vouchers available too, it’s now cheaper than ever to book. As well as all-inclusive, luxury, beach, family friendly and city holidays, TUI also provides multi-centre holidays. These holidays let you visit more than one destination in a single trip, so you can head out on a multi-day guided tour in a country like Vietnam, before chilling out at a beachfront hotel. Or, you can combine your beach break with a stay in a city like Croatia’s Dubrovnik and even hit the open road on one of TUI’s driving holidays in Florida. These holidays are great if you’re looking for some adventure and diversity, perfect for eager travellers who want more than a beach holiday in one resort. And what’s more, when you book with TUI there’s no need to go searching around for the cheapest prices, connecting flights and transport to and from each location; they do all the work for you, so there’s no stress or hassle- all you have to do is choose your desired multi-centre holiday and book. One of TUI’s main selling points is their expansive range of cruises that come in all shapes and sizes, for all budgets and different types of travellers, to locations all over the world including the Caribbean, Asia, the Mediterranean, the Baltics, Central America, the Canary Islands and much more. TUI’s cruise line is so big they’ve recently created Marella Cruises, which now features six different types of ships in its fleet, sailing to 120 destinations across the globe. Choose from all-inclusive cruises, cruise and stay cruises, family cruises, cruises from the UK, last minute cruises, summer cruises, European cruises, winter cruises and adult only cruises. Browse through a number of cruise deals, or book your cruise way in advance using a 2019 discount code to save money on your offshore getaway. Discover cruises with cinemas, shopping facilities, climbing walls, pools, 5* entertainment and plenty of dining options and enjoy an amazing holiday on board as well as when you dock. Book your shore excursions before you sail and enjoy amazing experiences in multiple locations on a cruise holiday of a lifetime. If you want more than your typical beach holiday then you can discover beautiful natural scenery and picturesque views of the lakes and mountains collection at TUI. Soak up local culture on a European lake holiday, stay in ancient harbour towns in historic hotels, where you can relax by the clear blue water and enjoy a cocktail on the piazza. Choose from stunning lakes around the world including Lake Garda, Lake Maggiore, Lake Como and Bled. If it’s a mountain holiday you’re looking for then you can look forward to some of the most spectacular scenery in the world. From the Austrian peaks to the green pastures of the Italian Dolomites, you can enjoy a landscape of pretty walking paths and views that stretch for miles. Discover mountain holidays in Austria, Italy, Slovenia and Switzerland, all with the most amazing views, and at affordable prices too. What is the baggage allowance on Tui flights? When flying with TUI Airways, you’re entitled to a 15kg luggage allowance on all package holidays, with some holidays even permitting a bigger allowance of up to 20kg. You can also take 1 piece of hand luggage, weighing up to 5kg, with both flight only bookings and package holidays, as long as said luggage bag has dimensions no bigger than 55x40x20cm. Remember, booking your luggage allowance online with TUI Airways is cheaper than paying at the airport so it’s worth thinking about before you arrive for your flight. Click here for more information on the luggage allowance for premium club members, infants, ski holidays and more. When can I check in with TUI? You can check in for your TUI Flights easy and quickly online up to 30 days before you're due to depart. Simply select the Account & Bookings category at the top of the TUI homepage, either log in or view your booking using your departure date, booking reference and the name of the lead passenger. From here you will be able to check in online saving you time when it comes to your holiday. How long before my holiday will my TUI tickets arrive? If you have provided TUI with an email address when booking your holiday, your holiday voucher will be delivered directly to your email 4 weeks before you depart. You may have chosen for your vouchers to be delivered to your postal address in which these will be delivered 3 weeks before you depart. How early can I check in with TUI? At airports in the UK, check-in desks open approximately 2-3 hours before departure time. Passengers taking Long Haul flights should check in 3 hours before departing. Can I amend my TUI Booking? yes - simply visit the 'Manage My Booking' page to make any possible amendments to your holiday or get in touch with the TUI team. Please note that charges may incur. If you’re looking for a top quality 2019 holiday, city break or cruise look no further than TUI. Previously known as Thomson, this holiday brand is synonymous with excellence and affordability, providing everything from all inclusive family holidays to low-cost city breaks and budget flights. With a plethora of destinations in their repertoire and loads of holiday extras available, you can rest assured that Thomson will tailor make the perfect holiday for you, no matter what your requirements may be. Book online with a TUI discount code from us and save yourself hundreds on your next holiday. Whether you’re booking last minute or in advance, there are always savings to be made, with plenty of discounts already available for 2019 holidays and cruises too. We are constantly on the hunt for Discount Codes for TUI to help you with your money saving. Our experts check dozens of sites for secret codes including NHS discounts, student sites & social media channels saving you time & money! Be sure also to check how safe your destination is & follow government advice on the Travel Aware website.